What are some of the things to expect as your dog ages? Your dog may develop arthritis or other degenerative diseases that cause him to slow down. He may not be able to walk as far or play as long. He may tire more easily. He may have difficulty getting up or finding a comfortable position to sleep in. He may become reluctant to go up and down stairs or have difficulty getting into and out of the car. Without proper care, dental disease can pose a problem, particularly for older pets. You may be surprised to learn that veterinarians find evidence of dental disease in many pets as early as 2-3 years of age. If nothing is done to care for your dog’s mouth, by the time your dog is a senior, he may even have lost some teeth. Dental disease can be painful, causing your dog to avoid or have difficulty eating his meals. This may result in weight loss and an unkempt hair coat. Dental disease is certainly not the only disease that can lead to weight loss. Senior dogs frequently suffer from kidney disease, liver disease, heart disease and other conditions that may result in weight loss. Feed your older dog a high quality diet. Also, learn to read the dog food label and choose a diet that is appropriate for your dog’s age and lifestyle. Consider fortifying your senior dog’s diet with fatty acids such as DHA and EPA.They have been shown to be useful for dogs with mobility issues due to arthritis or other joint diseases. 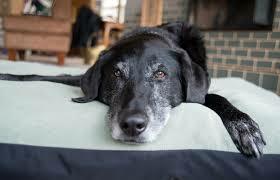 Supplements such as glucosamine and chondroitin are also beneficial for senior dogs.